Sipping a cup of tea with some puffed rice, 50-year-old Rajesh Munda’s sunken eyes were patiently waiting for the hospital on the wheels to station at his door step on a Saturday morning. Over the past couple of days, Rajesh, a plantation worker, has been complaining of chest pain, a racing heartbeat and dizziness. Its on weekends that the mobile medical unit or the hospital on wheels visits their tea garden, Dikom Tea Estate (Sesha Division), located at Dikom in Eastern Assam’s Dibrugarh district. Visibly anxious, Rajesh was waiting in a queue to narrate his troubles to the physician. “My chest hurts and I often feel exhausted. I suffer from severe headache as well,” Rajesh said as he approached the physician. The physician without wasting anytime measured the blood pressure of Rajesh and then prescribed some high blood pressure (hypertension) medicines. The physician also advised him to avoid salt as much as he can. Rajesh’s case is not an isolated incidence of hypertension. The prevalence of hypertension among tea plantation workers was found to be very high. 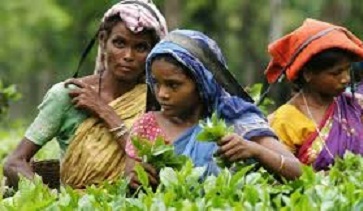 A 2002 study by the Regional Medical Research Centre (RMRC) in Dibrugarh estimated that 60.8% of tea plantation workers in Assam suffer from the disease. The RMRC researchers found overall prevalence of hypertension in the age group of 30 years or more among this community figured at 60.8 per cent, which is one of the highest in the country. According to the approximately 50 per cent of them have either developed or are prone to develop the condition in future. Although maximum cases of hypertension were found in the age group of 60 years or more in both genders, women were found to have high blood pressure in all age groups. The study revealed that factors like increased age, not living with spouse, consumption of locally prepared alcohol, chewing of tobacco like khaini, high intake of salt in one’s daily diet and a sedentary life or a less active job compared to heavy manual labour trigger the risk of hypertension. Consumption of hooch was found to be a major risk factor that triggered hypertension in both men and women. “Ideally, a person should not consume more than 6gm of salt daily. The salt used in cooking our food is sufficient for the body and one need not take extra salt. Most of the tea workers consume alcohol and tobacco products in large quantities, which are high risk factors leading to hypertension,” J Mahanta, the director of the RMRC, had said. A recent investigation by this reporter in some of the tea garden in Dibrugarh, Golaghat and Sonitpur districts has revealed that the situation has not changed at all. The reports from tea garden hospital hospitals revealed a high prevalence of hypertension among the plantation workers.